So i'm going for my first track day friday and i need some tips. I know there is plenty of threads regarding track days but i'm looking for the things people tend to overlook. Like what should i take with,what to expect on that first lap,any spare parts that is a good idea to take along. Tips that comes with personal experience. I'm a bit nervous so any help would be awsome. Spare parts is hard to account for considering if you go down it could be scratched up fairings or entire clip ons snapping off. I recommend just bringing a lot of zip ties. 1) Something to clean your visor (Honda Polish or Plexus). They get messy from bugs n' stuff. 2) If you don't have a tent, sun screen. 1) At least 5 gallon gas can filled. Some tracks have pumps, but it's more convenient to just bring it with you. 2) A lawn chair or something of the sort. 3) Water and healthy snacks. Don't be nervous, there's little to be nervous about on a track. No cops, no cars, etc. Never look back except when you're pitting out onto a hot track. NEVER look back except for that situation. It'll mess up your lines, slow you down, it's down right dangerous for you and everyone around you and most track organizations will penalize you for it anyways. If a guy is really faster than you, he'll find a way around you. If he just buzzes in your ear, it's possible he's simply keeping up with you or him following your lines is making him able to keep that pace. All you are responsible for is what's in front of you and what's in your peripheral. Talk to everyone. Talk to the control riders/coaches, talk to the intermediate and advanced guys, talk to fellow B group riders... Absorb what you can. Your first few laps you're gonna be so overwhelmed by information like entry, apex and exit cones, braking markers, etc. that you won't have time to be nervous. By the afternoon you'll be working so hard on getting down what you learned in the morning that you won't have time to worry and just as you feel like you're really getting into the groove the day will be over and you'll be on your smart phone looking up the schedule for the next track day. Your credit cards and checking accounts have been warned. Welcome to the addiction. Thanks for the great advise Raylee,really appreciated.! I will give some feedback as to how it went and try and get some pics up aswell! Moved your post here to the Track Techniques section. 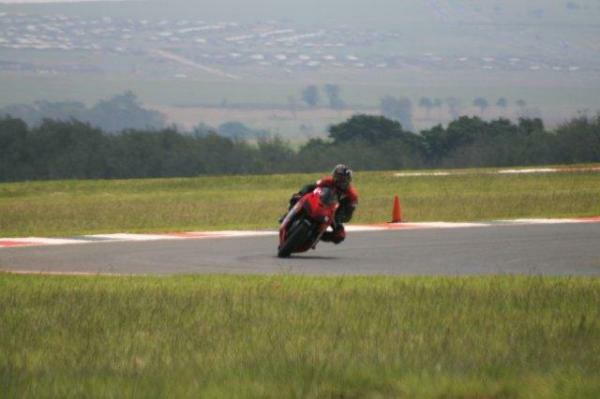 See my sticky at the top of the page... Its a great resource...especially for new track day riders. Believe it or not most people forget their keys.Set your cold air pressures,make sure all your gear is on secure.First lap take it easy and learn as much of the track as possible,do not ride over your head,learn where the turn in points are and most important have fun. Which track are you doing? So i'm still alive and kicking. What a experience though,damn,i see myself visiting the track more often. 1 Thing that troubled me a bit was the fact that my bike shutters under hard braking,what can this be? Welcome to the addiction! !I started like you,just want to do one.18 trackdays later,I'm still looking forward on doing my next one. When you say (shutters under braking,)Are you referring to the rear brake? If so,don't use it so hard or better yet don't use it at all. I don't use my rear brake,i only use my front and down shift. I't is new brake pads which i fitted about 2 months ago so i really don't know,can it be the discs? Congrats! Not anywhere near as bad as you expected, right? Anyways, next time out you should consider seeing the guy doing suspension setups at the track. Quick Reply: First track day tips?